If you call yourself a basketball fan, you really have to plan a pilgrimage to Springfield, Massachusetts. Fans of all ages can easily lose themselves for hours within the three-story, spherical Naismith Memorial Basketball Hall of Fame, which has 35,000 square feet of exhibit space for basketball memorabilia and artifacts, three theaters, interactive kiosks loaded with Hall of Famer data and trivia, a Subway restaurant and a Hall of Fame museum gift shop. That's just for warm-ups, though. The real fun is hitting the full-size "Center Court" for some shooting, passing and other skills challenges or heading to the second floor's high-tech, experiential attractions that allow you to measure your vertical leap, sit in the broadcaster's seat, coach a team to victory and even play a game of "Virtual Hoops." 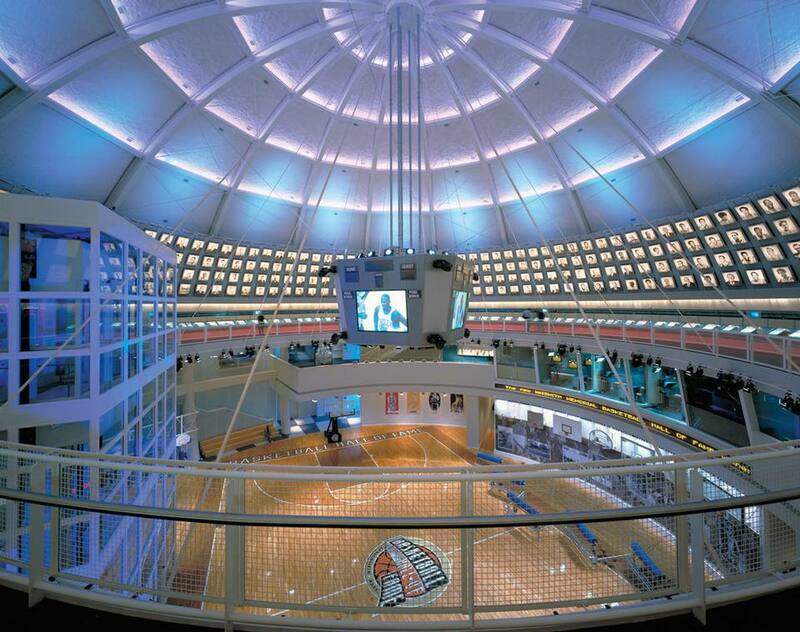 More than 15 years after this $45 million, 80,000-square-foot facility replaced a much humbler Hoop Hall in Springfield, the Basketball Hall of Fame continues to immerse fans in the excitement of this fast-paced game, which was born in Massachusetts more than a century ago. They say that necessity is the mother of invention, and during the brutal New England winter of 1891, James Naismith, a physical education student at the YMCA Training School in Springfield, Massachusetts, now Springfield College, found himself with an unenviable assignment: devise an indoor game to occupy the attention of a rowdy class of young men. A couple of peach baskets, a soccer ball and a set of 13 rules later, Naismith had given birth to the game he called "basket ball." The recreational sport spread like wildfire as Naismith's original rules were circulated to other YMCAs, and by 1936, the game's inventor had the pleasure of witnessing the introduction of basketball as an Olympic sport at the Games in Berlin. Still, it's not likely he ever envisioned that basketball would become a sport played by more than 300 million people in more than 200 countries of the world. Nor could he have likely predicted the heights to which today's professional basketball stars have soared. The first Basketball Hall of Fame opened in 1968 on the campus of Springfield College. In 1985, the Naismith Memorial Basketball Hall of Fame was relocated to downtown Springfield. As the city's planners began in the late '90s to dream of an expanded and revitalized urban environment along the Connecticut River, it was only natural that the Hall of Fame would serve as the centerpiece of the Springfield Riverfront Redevelopment Project. In addition to the new shrine to Naismith's game and its legendary players, the 18-acre project features Samuel's Tap & Table, an UNO Chicago Grill, Plan B and Max's Tavern restaurants, the Hilton Garden Inn, a Visitor Information Center and a riverfront park. Here are all the fine points you need to know including address, directions, hours, admission prices, nearby attractions, hotels and more. Location: The Naismith Memorial Basketball Hall of Fame is located at 1000 West Columbus Avenue in Springfield, Massachusetts. Dates and Hours of Operation: The Hall of Fame is open Wednesday through Sunday from late November through March 31 and daily the remainder of the year. Hours are 10 a.m. to 4 p.m. Sunday through Friday and 10 a.m. to 5 p.m. Saturday, with extended hours until 5 p.m. every day from July 1 through the Sunday of Labor Day weekend. Because the Hall of Fame may close for private functions, it is wise to confirm hours of operation ahead of your visit. Admission: Admission to the Basketball Hall of Fame (as of 2019) is $24 for adults ages 16 to 64, $18 for seniors ages 65 and up, $16 for youths ages 5 to 15 and free for children under age 5. From the East... Take the Massachusetts Turnpike West (I-90) to Exit 6 for I-291 West. Follow 291 West to Exit 1A for I-91 South. Take Exit 6 (Union Street) and proceed onto West Columbus Avenue. The Hall of Fame is on the right. From the West... Take the Massachusetts Turnpike East (I-90) to Exit 4 for 91 South and follow directions as above. From the North... Follow 91 South to Exit 6 and follow directions as above. From the South... Take 95 North to Exit 47 for 91 North (New Haven). Continue straight on 91 North for 64 miles until Exit 6, the Springfield Center exit. Turn left onto Union Street at the first set of lights. At the next light, turn left. The Hall of Fame is on the right. Where to Stay Near the Basketball Hall of Fame: You can't get closer than the Hilton Garden Inn Springfield, which is part of the riverfront complex and just a short walk across a parking lot to the Basketball Hall of Fame entrance. Call 413-886-8000 or toll free, 877-STAY-HGI for reservations. The MGM Springfield hotel is the newest, coolest nearby place to stay. For More Information: Call the Basketball Hall of Fame at 413-781-6500.